I tackled this recipe in stages, although ran into a few bumps along the way. The puff pastry I made last week. My plan was to make the pastry cream and buttercream the same day, then freeze it overnight. So I made the pastry cream, no problem. When I went to make the buttercream, my thermometer broke! So I had to throw out the batch and buy a new thermometer. That set me back a day. I finally got it all made, and ps- my new digital thermometer worked great! I combined the two creams to make mousseline, spread it in the pan and froze it overnight. Meanwhile, I baked the puff pastry. It was interesting how it was baked under the weight of three sheet pans. The whole beauty of puff pastry is that it puffs, but this was a controlled puff. I didn't have to bake it as long as required, it was quite golden brown all over after only an hour. Since this pastry is best eaten immediately, I had to wait over the weekend to complete the assembly, since I wouldn't be able to share it with anyone. The assembly was actually the easiest part of the whole recipe. I just whipped the cream and put it all together. The puff was quite crumbly and flaky, so it was delicate to work with. I cut the mousseline to fit, and layered the puff and cream together. Then, tipping it on the side, I piped the whipped cream on top. I didn't have the recommended pastry tip, so I used a leaf or petal tip and made kind of a wavy ribbon pattern on top. The final result is quite impressive, and would elicit many oohs and aahs when presented at the table. I sliced off a bit from one end to try. The puff I think was overbaked, it had a slightly charred taste. 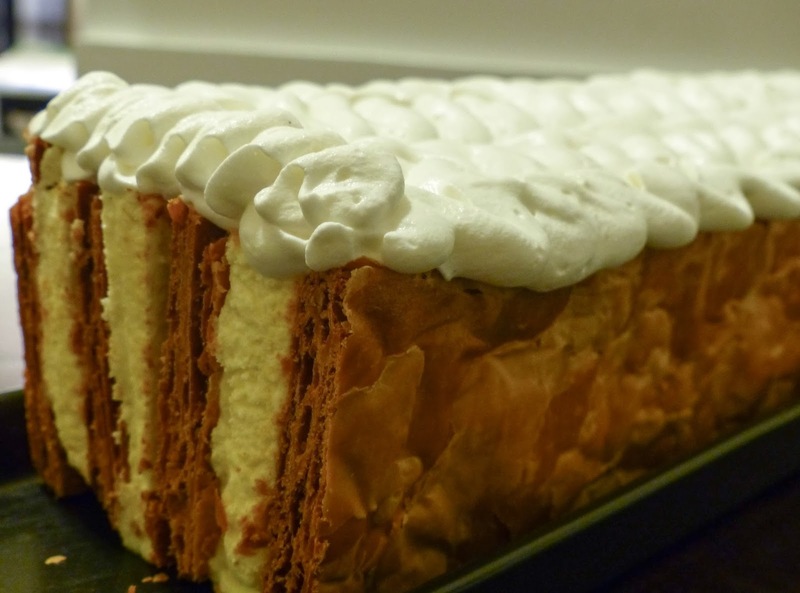 The mousseline is creamy and rich, and the whipped cream on top was light and divine. Overall, it seemed like way too much work for the end result. I wasn't blown away by it, and knowing how long it took to make it, I wouldn't make it again. I'd rather just order it in a café and enjoy it there. 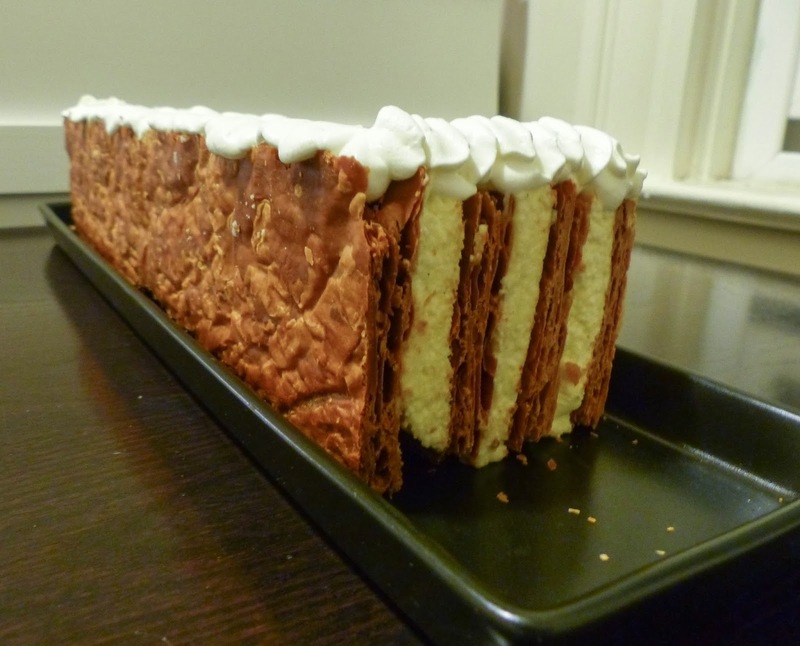 The millefeuille was my first introduction to French pastries as a child and it has remained my favorite. The classic version has a white icing on top, sometimes with a striped chocolate icing pattern for extra flourish. The Bouchon version with whipped cream garnish is a good move, adding lightness to a very rich pastry; however since my rendition has chocolate pastry cream, I thought I'd do a dusting of cocoa. As for portion size, I made mine individual servings that I typically see at patisseries. Aside from these changes, the technique and recipe remained the same. Baking the puff pastry sheet took quite a while and the book's guide is accurate. The initial bake was approximately 1 hr and 30 min covered. I didn't flip the sheet over because my puff was browning evenly both top and bottom. After the initial bake though, the middle was still soft and not as golden in color so I put a couple sheets of foil on the ends so they wouldn't burn and baked the puff once more, uncovered for 10 minutes to dry out the top. The result was beautifully golden but I noticed it was incredibly flaky and shattered looking, not quite as tight and compact as I am used to. Perhaps I needed to put a lot more weight on the pans to keep the layers from puffing. Freezing the pastry cream was great. It makes it easy to cut and eat. Typically the technique requires piping the cream onto the sheets of puff and when you go to eat, the cream splurts out. As for overall flavor, I was really happy with out this turned out. The flaky pastry with the cream filling is the perfect textural combination. I will admit the chocolate is a bit rich for my taste. I prefer plain, but if I did chocolate in the future I'd do one layer plain and one chocolate. Et voila! More on my blog.